← Therein lies the rub …..
live in do we (as Yoda might say). I’m referring to the debate regarding the traditional food pyramid and the new thinking around the benefits of a high protein diet. When I grew up a healthy diet consisted of lots of carbohydrates and starches, less protein and little fat or sugar. Today this thinking is being challenged by the likes of Tim Noakes among others and I was interviewed yesterday by an Irish film crew making a documentary about a super sportsman who is testing out a high protein diet in an effort to avoid hereditary heart disease and diabetes. Red meat has received lots of negative press in the past and has been linked to heart disease and cancer. A Harvard medical school study of 120000 people from 1986 to 2008 concluded that adding red meat to their diet increased their chances of dying from cancer by 10%, dying of heart disease by 18% and they were 13% more likely die early (source: Johnathan Benson, NaturalNews.com). Impressive stuff from a prestigious institution but with one fatal flaw. The red meat in question was grain fed feedlot beef. Or to put it another way, according to the Harvard study if you eat grain fed feedlot beef you are more likely to get cancer or heart disease. Benson also mentions a study conducted by researchers at California State University and University of California that was published in Nutrition Journal in 2010 that evaluated the difference between grain fed feedlot meat and grass fed pasture reared meat. The research found that the omega-3 fatty acid profile in grass fed meat was similar to that of fatty fish. Grass fed meat was also higher in CLA, carotenoids and vitamin E tocopherols which protect against cardiovascular disease and cancer. You can read the rest of the article here. Mmmmm gets a bit confusing after a while doesn’t it. 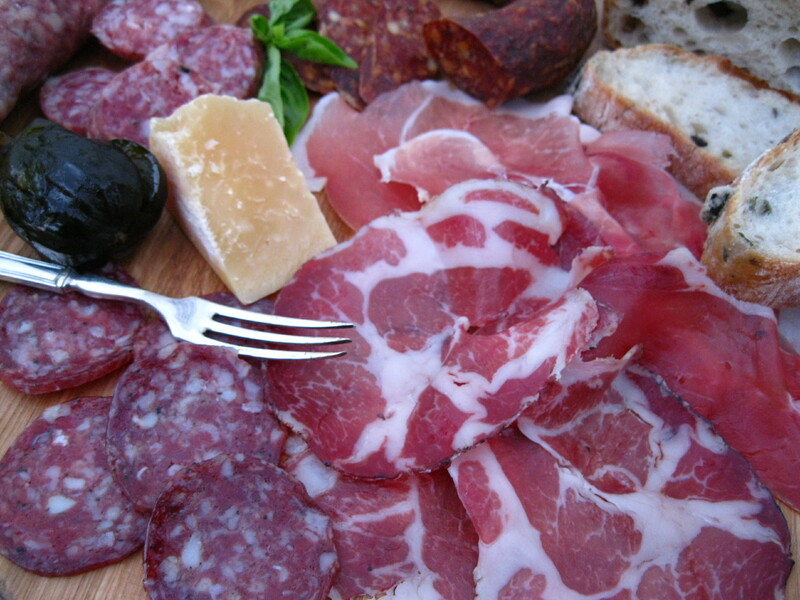 According to ibergour.co.uk, a supplier of acorn fed pasture reared Iberean ham, the fat of Iberico belotta ham contains 55% oleic acid which has a proven beneficial effect on cholesterol, lowering LDL and raising HDL levels. The only fat with higher oleic acid is virgin olive oil. So eating the fat from the ham can be good for your cholesterol levels. The hams also contain vitamins B1, B6, B12 and folic acid as well as vitamin E, copper, zinc, calcium, magnesium, phosphorus and selenium, all of which have health benefits. The diet of the pigs plays a major role in providing these nutrients in the meat. I think it is fairly intuitive that eating pasture reared meat that has not been given hormones or preventative antibiotics, has lead an active life and eaten a natural diet is better for you than eating feedlot meat. You can see more here in this clip from Joel Salatin about feeding cattle grass and not grain. I’m not sure if I’m ready to give up carbs though. Freshly baked ciabatta with a drizzle of Prince Albert extra virgin olive oil is one of the simple pleasures of my life and I would be sad to have to deny myself forever. I think my personal eating plan may well end up as a food tower instead of a pyramid – everything in moderation. I also want to know the provenance of my food for 2 reasons. Firstly to ensure my health, I have plans for when I am 80 and want to make sure I can enjoy them. Secondly, as an omnivore I want to be sure that what I consume has been produced ethically and with integrity. 1 Response to Interesting Times……..